For appetizers, I have planned a fruit tray, some fresh veggies and hummus and this Heirloom Tomato Tart from S&C (Sweet and Crumby). It never, ever goes anywhere without rave reviews and is ridiculously easy if you choose to buy your pie crust. Of course, there will be a Honey Baked Ham because at our house that IS a tradition. 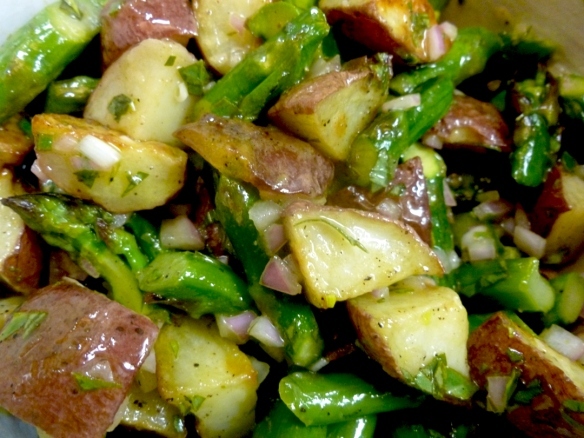 We have family bringing some delicious salads, but one that I can’t get my mind off of is this Warm Asparagus Potato Salad with Lemon Tarragon Vinaigrette I got off Bits and Breadcrumbs. Thanks Betsy! This will definitely be making it to our buffet table! Photo taken from Betty Crocker's site. 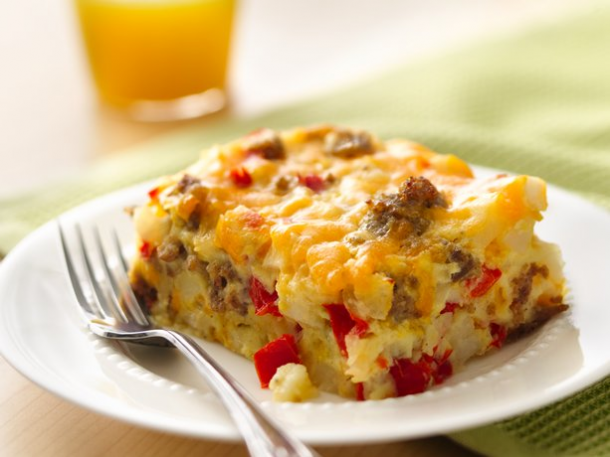 I would love to serve this Egg Casserole from Misadventures in Cooking. It’s even Gluten-free, and if I leave out the sausage and add an extra veggie or two, it can be a hearty vegetarian offering as well. 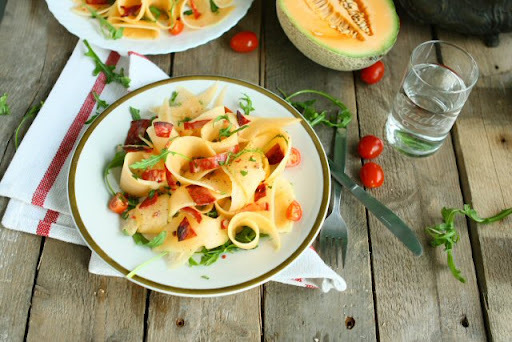 Oh my, Angie’s Cantaloupe Ribbons Salad with Chorizo is breathtaking, and I will be amazed if I can pull this one off. But wouldn’t my guests be impressed? After lots of salads and casserole eating, we will be ready for some decadent sweet treats. What a fun and festive cookie tray these Funfetti (Momofuku) Cookies would make from Just a Smidgen! 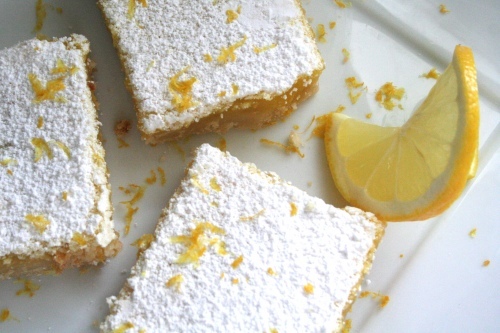 And how about these gorgeous puckeringly tart and spring-y Lemon Bars from Sweet Caroline’s Cooking? These would brighten up any dessert tray. And what’s Easter without some Carrot Cake? 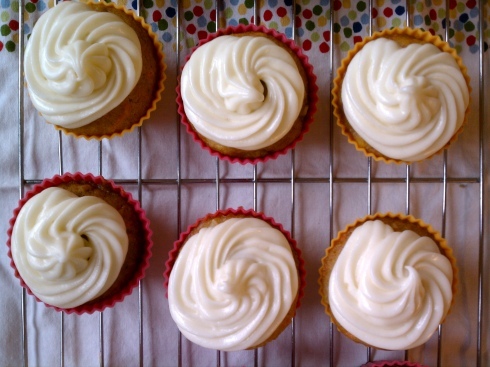 I think these Carrot Cupcakes from Offally Tasty are just the right size for a dessert buffet, don’t you? 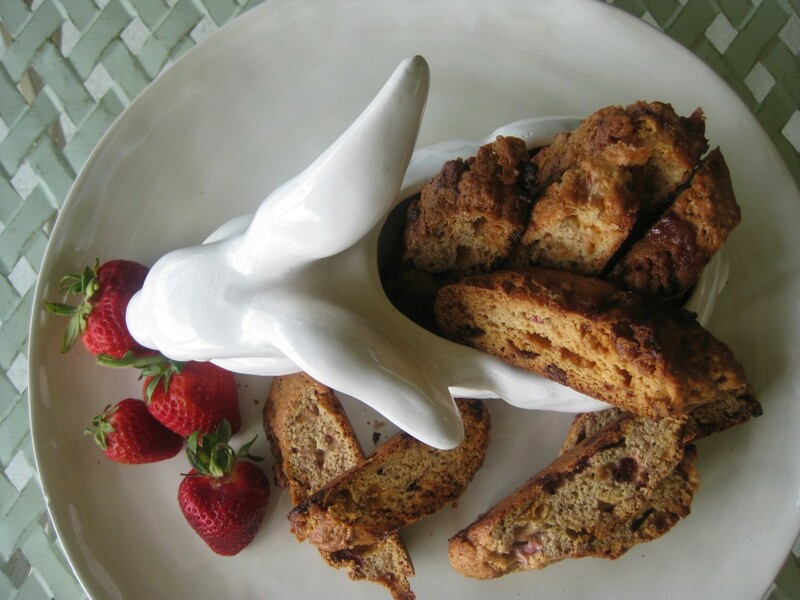 And finally, last but definitely NOT least, I will need to sit down, put my feet up and have some coffee and these Strawberry and White Chocolate Chip Biscotti from Linda’s Savoring Every Bite. Guests can nibble on these addicting cookies while I unwind. 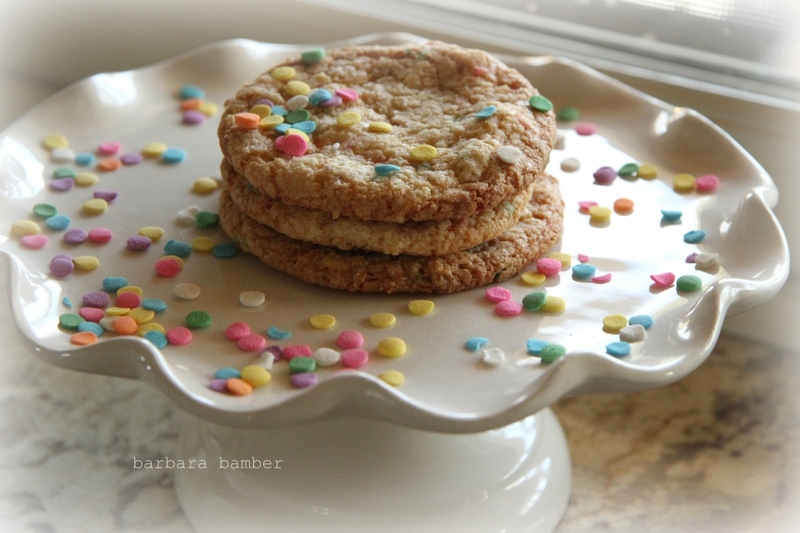 Well, I hope you have enjoyed this round up of delicious Easter inspired desserts! And for my readers who will be celebrating Passover, go to The Shiksa’s Passover Potluck for some amazing looking Kosher fare. Consider yourself invited then! 🙂 Have a very nice weekend. Are you planning to meet up at BLD next week? It will be a handful to host this Easter brunch, but everyone brings something so it’s all good. The tomato tart and the cupcakes look fantastic. Everything else is yummy as well! Everything looks great, but the potato salad and lemon bars are definitely calling my name! Hope you have a great Easter weekend. What a wonderful menu! Your guests are in for a memorable time. I’ve sent a no-nonsense letter to the Postmaster General demanding he locate my invitation to your party. Heads will roll! In the meantime, I hope you and yours have a great holiday & celebration, Geni! Well, if you can make it So. Cal., you are most definitely welcome to come. Try to go easy on the postmaster…it just may not be his or her fault. Great round-up of recipes! And I can’t believe you’re cooking for 30. I’ve cooked for 17 on Christmas Day and it was quite a struggle! I love a parade! and even more so a Foodie one!! Great round up and wow, that cantaloupe salad looks amazing! You shared some new blogs and recipes to me here. Thanks for including my biscotti! I do wish we could share a cup of coffee and biscotti one day! It will only be my son and I on Easter as my daughter went to Orlando (which she better never do again on a holiday!) plus we are still just packing, so no real Easter dinner this year!! Wishing you a Happy Easter Geni!! What a great roundup. And I’m so glad you linked to Bits and Breadcrumbs’ recipe, because I didn’t bookmark it when I saw it. Wow, that’s a LOT of people 🙂 I hope you’re having a wonderful Easter weekend. Great round up Geni. 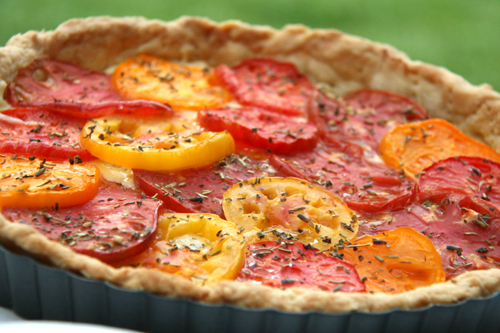 That tomato tart looks so good and the colors are so vibrant! We did, thank you! Go eat Kay. What are you waiting for? No worries. I am glad you have been enjoying the warm outdoor weather you have been having and getting out with the fam. Hey thanks! I just noticed you had me up there (or, at least the cupcakes ;)). I hope you had an amazing easter! !